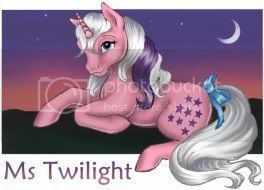 My Little Pony Arena » Forums » Pony Talk » Pony Corral » Caring for My Pretty Pony? Forums » Pony Talk » Pony Corral » Caring for My Pretty Pony? Caring for My Pretty Pony? 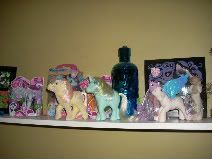 Posted: 0 Post subject: Caring for My Pretty Pony? Her ears and one eye still function, which is great! My problems are cosmetic. For one thing, the thrift store in question typically puts their prices on ponies and similar thing by using a black wax pen, and she also has some black smudges on her body, which might be from the same. Acetone will remove this, which is what I use when I bait the ponies I go to the thrift store for, but this lady is definitely not bait. The price mark is on the bottom of one hoof, but I still would like to know if her body color is the natural plastic color, or if it's likely to come of if I use acetone to remove the smudges. My other issue for her is with her hair. It's dry, to say the least. Looks and feels kinda like hay, except for a bit of tackiness. Her tail is also crimped like it was braided for way too long. I'd like to keep the original hair on her (possible forelock cut or not), but don't know what to specifically do. Any input for these issues would be most helpful. My creativity keeps running into the wall of "it's already been done." Posted: 0 Post subject: Re: Caring for My Pretty Pony? Personally, I wouldn't use acetone on her..her plastic is a different kind from regular ponies and I'd be afraid she's melt. Grease or wax pencil comes off easily enough with some elbow grease and maybe some dish washing liquid. Other than that, magic eraser! Their hair seems to always be dry. I've got 3 of them and all of them have that hay-like hair. Be careful brushing the tail. One of my gals had lost the little piece of string that goes around their tails on the inside, and you can pull hairs right out if you're not careful. Their tails are only a doubled hank or hair looped around a post inside and tied with string. wow, that was a lucky deal! would you mind taking a picture? I would try magic eraser or even a regular pink eraser on her plastic. Mine has dry hair too and I'm not about to mess with it. It will change the texture of the plastic for sure. Make it more matte. I'd probably even avoid magic erasers if you can. The hair is kinda stiff by nature. It's not like regular pony hair. You can use an iron on it though. Also, she's only supposed to close one eye (like she's winking) and her tail should also swish. Wow wickedwonderland! You did an amazing job!!! I have one that I need to fix that's way worse hair wise... I'm dreading it! Thanks to MustBeJewel for my sig! If I was local I'd be glad to help. I've taken on way worse. My Sugar Sweet's hair was THOROUGHLY matted and brownish and my Honeysuckle had hard candy melted in her tail that had probably been there for 20 years. I still think Sugar Sweet is a mini-miracle. Her hair is like mint condition now. wow what an amazing find!! she is sooooo pretty!!! "All the white horses are still in bed" t.a. WickedWonderland, that restore is awesome! Did you brush her hair regularly before ironing, or use conditioner in it to get the matts out? Thanks everyone! I'll try using regular soap and water on her first. I'll take pictures when I'm able; not sure where my camera is right now, though. I also appreciate the info! I found one about six months ago and haven't tried to clean her up yet. Wow WickedWonderland, you really worked some magic with that flat iron! I put conditioner in her hair, combed it out, and then ironed on low heat with the conditioner still in her hair. Acetone will melt the plastic, I used some on our light fixtures which are the same plastic as a PP and it melted and took a few layers of plastic off. Soapy water should get everything off, good luck. Wow. Flat iron for the win! My thrifted Pretty Pony has horrible straw hair. I used a ton of conditioner and it didn't do much. I may have to invest in an iron. As for the marks and grease pen, I ended up using a Magic Eraser with great results.